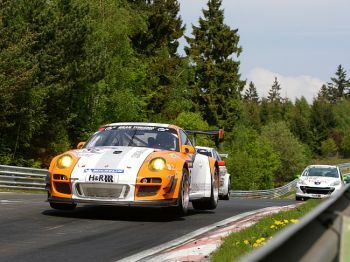 The Porsche 911 GT3 R Hybrid has taken its first competition victory in a four-hour endurance race at the Nürburgring. And hybrid efficiency played a key part in the win. This goes some way to make up for Porsche’s huge disappointment this time last year when the hybrid 911 race car was just two hours from taking victory in the Nürburgring 24-hour race when a mechanical failure saw it grind to a halt. Since then the 911 GT3 R Hybrid has raced all over the world, including appearances in the US and China. But that its first major win has come at the ’ring following the disappointment last year must be a great boost for the team behind its development. Porsche refers to this 2011 911 GT3 R Hybrid as the Version 2.0, the 2011 car 50kg lighter than the first version and weighing in at a respectable 1,300kg. Power in the two motors driving the front wheels has also been increased from 60 to 75Kw each. This equates to a power boost of 200hp for limited bursts when exiting corners or, on demand via a ‘push to pass’ style button, overtaking. Porsche claims that over a lap of the Nordschleife the hybrid system is equivalent to an additional 32hp. One of the reasons Porsche has been able to keep the weight down is the use of a kinetic generator rather than heavy batteries. Under braking the electric motors drive a flywheel that then spins at up to 40,000rpm, this energy then used to power the motors under acceleration. A version of the same system also features in the Porsche 918 RSR concept, revealed earlier in the year at Detroit. But while that’s a concept the 911 GT3 R is a very real ‘rolling laboratory’. And Porsche will be happy that the car’s efficiency was one of the key factors in its victory, the hybrid pitting twice for fuel while rivals were forced to stop three times. As a result the Hybrid came home seven seconds ahead of a conventional 911 GT3 RSR. This all bodes well for the 911 GT3 R Hybrid Version 2.0’s return to the Nürburgring 24-hour on June 25-26, the improved efficiency and – hopefully – reliability combined with the proven pace enough, Porsche hopes, to challenge for an outright win.